UPDATE: Earlier this year the realm passed into the hands of young King Nicholas. A mere 150 miles northwest of Los Angeles lies a nation within our nation. Calsahara is one of many such places—little so-called countries like the Principality of Sealand and the Republic of Molossia that claim to be sovereign, but really aren’t. Each has its own culture, costumes, and symbols (many captured in wonderful detail by French photographer Léo Delafontaine). 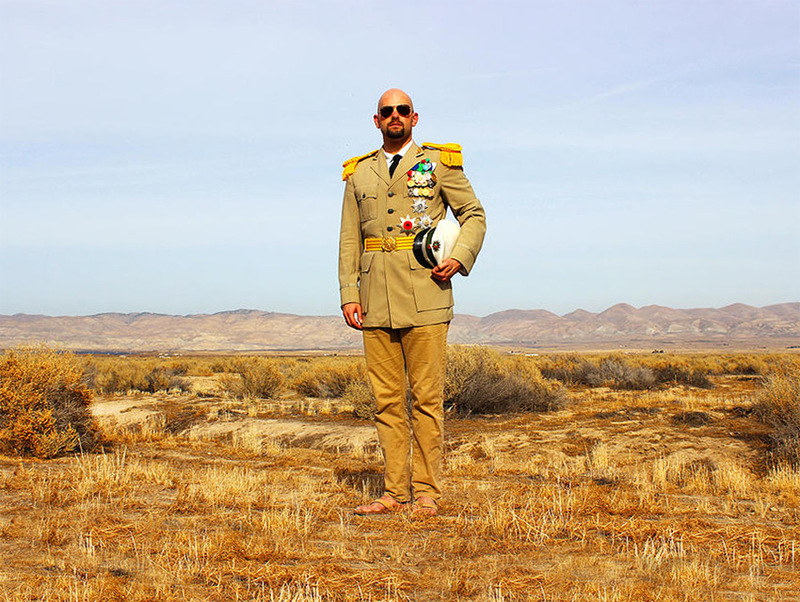 Calsahara is governed by the enigmatic Travis McHenry—a man who, from his online presence at least, looks the part of a North African warlord. His mini domain is, according to his Web site, both “A kingdom beyond compare!” and “a barren wasteland.”It’s one he’s willing to share. Obtaining Calsaharan citizenship, it turns out, is as easy as filling out an online form—race and religion are, inexplicably, required fields—and visiting the country in person. I completed the application, grabbed a couple sleeping bags and my roommate Brian, and made the three-hour trek beyond cell service range to a brush-covered field (Calsahara) that’s surrounded by identical brush-covered fields (the United States). As forewarned, I found Calsahara to be flat, empty, and absolutely worthless. 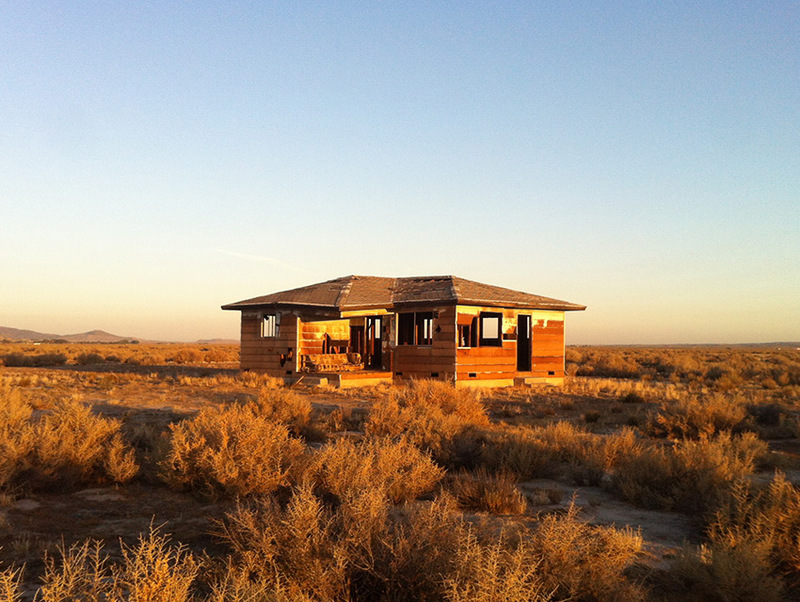 Its most impressive feature is a dilapidated shack. “Hooverville,” as it’s called, is the country’s only shantytown. The “Seven Seas of Rhye” is a stagnant pool of red-hued water ringed with salt residue and foul smelling mud. “Otisburg,” the national capitol, is literally nothing—a corner of land you can only identify by the intersection of two dirt roads—though since I visited, McHenry has installed “Montague Square” (a few slabs of ride tile) and “the founders footprints” (two brass feet memorializing the day of his arrival). Calsahara, it seems, exists more in the person of its founder that it does in actual space. When I talked to His Excellency Travis McHenry, Dictator for Life, he was on break from jury duty (“So it turns out my status as a dictator is not sufficient to get me out of jury duty at the L.A. courthouse,” he wrote in an email a few days before our interview). A native Pennsylvanian, McHenry currently lives in West Hollywood. He visits Calsahara at least once a year, “just to sort of reassert the claim, raise the flag again, and make sure everything is OK—not stricken by wildfire or flooded or, you know, the natural disasters that do happen up there.” After all, a nation where 100 percent of the population is expats is pretty low maintenance. At his day job, McHenry recruits psychics to work for the largest psychic services company in the world. Only occasionally does he don his trademark commissar cap and formally reign. Calsahara isn’t McHenry’s first crack at a new country project; he founded Westarctica in 2001, claiming an eighth of the continent of Antarctica as his own through an alleged loophole in the Antarctic Treaty. An intelligence specialist in the U.S. Navy at the time, McHenry’s focus on anti-terrorism and foreign country intelligence gave him ample opportunity to ponder the operations of foreign nations and their governments. “Some of them are so ineptly and corruptly run,” he says, “that I said to myself, ‘Look, I can do this—anybody can run a country—this is easy!’” When his Navy superiors got wind of Westarctica and discovered that McHenry was communicating with foreign country leaders (writing them letters to convince them of his claim’s legitimacy) they required that he abdicate his throne. That was in 2006. Three years later, having left the military and moved out to California, he decided to get back in the game. 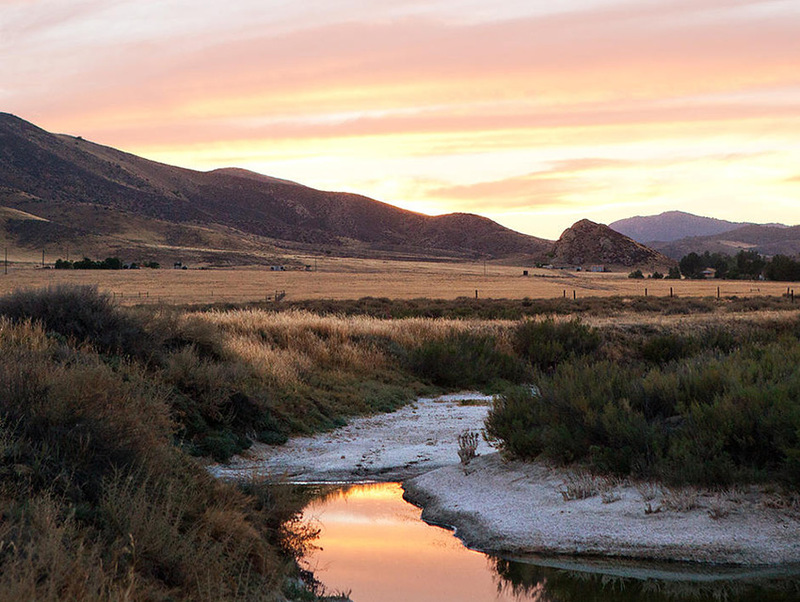 The story of Calsahara begins sometime in the 1950s or ’60s, when McHenry’s ex-wife’s grandmother, Boots Brannon, purchased a plot of land in San Luis Obispo County. At the time, McHenry says, land speculators heard that a pipeline was being built in the area and began buying, subdividing, and reselling plots of land in anticipation of development. The pipeline never came, though, and the land remained unused, divided into countless two-and-a-half-acre plots by a meticulous grid of unpaved roads, for decades. Along came McHenry, who was eager to get back to ruling a domain. When he discovered that his mother-in-law owned a tiny plot of land in the middle of nowhere that she was sick of paying property taxes on, he saw it as a calling. McHenry picked up the tab and named the land Calsahara (a portmanteau of California and Sahara—because you know, desert). He drove up to the land, raised the Calsaharan flag, and popped a bottle of champagne to celebrate. He has since expanded his realm to include 117 equally desolate acres. In photos McHenry appears in beige regalia, bedecked with dozens of medals, sporting aviators and occasionally a keffiyeh; he is always shod with Rainbow sandals. His aesthetic—flip flops aside—is inspired by former Libyan dictator Muammar Gaddafi. But the resemblance goes beyond appearances. It’s hard to discern whether Calsahara is a serious endeavor or an absurdly long-term joke (side note: McHenry trained as a method actor at the Lee Strasberg Institute). On the one hand, the whole endeavor is decidedly good-humored; consider the universal ban on Venn diagrams, for instance, or the selection of Coldplay’s “Viva la Vida”—sung by a children’s choir—as the national anthem. But then, there’s a surprising level of commitment behind such a low-reward operation—McHenry’s been at this for six years. 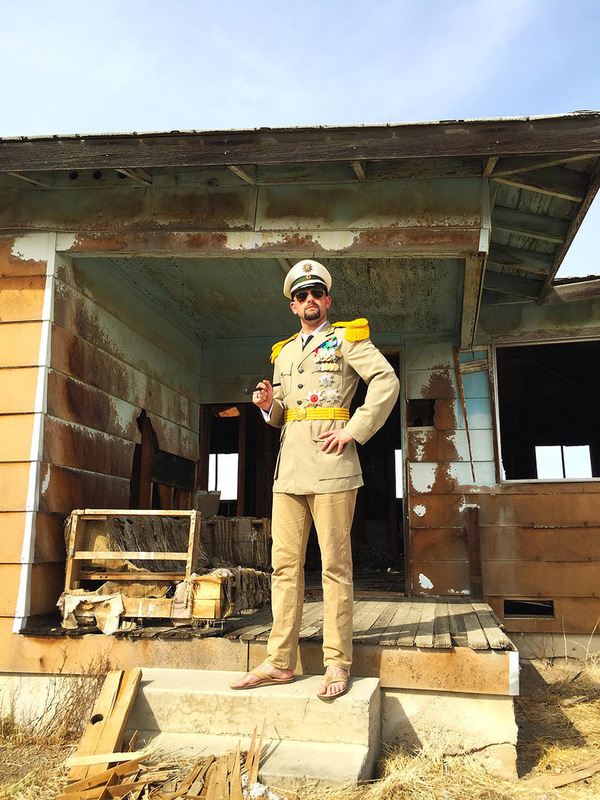 The fact that his pet project has generated little more than nominal interest over the years—McHenry tells me I was the first person to visit Calsahara independently—hasn’t deterred him from continued, if sporadic, investment in his micronation. He recently installed a few monuments on the land (the aforementioned Montague Square and Founder’s Footprints) and spruced up the Web site with new photos and video. And when I spoke with him, he was as eager as ever for adventurers, amateur scientists, Noah Purifoy wannabes, Burning Man copycats, and free spirits to buy into his vision of a libertarian sandbox and make Calsahara their own. “I would encourage tourists from Los Angeles to come up,” he says. “You’re basically free to set up camp anywhere—and if I’m available, I am happy to make the trip up there either with you or just to meet you there.” And he absolutely means it. Obscura Day Is an Excuse to Tour the Weirdest, Most Fascinating Corners of L.A.